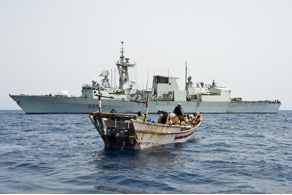 Her Majesty’s Canadian Ship (HMCS) Toronto, deployed under the French command of CTF 150, successfully disrupted 239 kilos of hashish and 10 kilos of heroin in the Red Sea as part of ongoing counter terrorism operations in the Indian Ocean area. 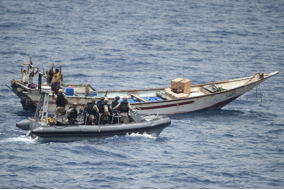 Between April 2013 and the end of June, HMCS Toronto has successfully completed six drug interdictions, recovering over 1.3 tonnes of heroin and around six tonnes of hashish, whilst conducting counter terrorism and counter narcotics operations as part of Combined Task Force 150 (CTF 150). The Halifax-class frigate is working with CMF to promote stability and security in the Indian Ocean. CTF 150 is currently being commanded by a French Navy Commodore and charged with countering terrorism related and other illicit activity in the region – including narcotics smuggling, which is a known source of funding for terrorist organisations. The Indian Ocean region is known for being one of the busiest naval passages in the world. Each year, there are around 23,000 shipping movements and HMCS Toronto has been consistently successful in disrupting the movement of narcotics in the region. Drug interceptions are one of many operations performed by HMCS Toronto. Narcotics smuggling in the Arabian Sea and the surrounding region is a recognized source of funding for terrorist organizations. The interception of illicit narcotics sends a powerful message to terrorist organizations that the world’s sea lines of communication will not be a freeway for sustaining the financial capital for terrorist activity and organizational growth. CMF and CTF 150 have been actively building links and working in close cooperation with local, regional, and international law enforcement agencies in the Middle East, enabling them to identify potential offenders at sea. Previous Previous post: Maritime Forces come together in the Arabian Gulf to practice Search and Rescue Techniques.